FILE PHOTO - Catalan President Carles Puigdemont gives a speech at the Palau de la Generalitat, the regional government headquarters in Barcelona, Spain, October 21, 2017. MADRID - Regional leader of Catalonia Carles Puigdemont will lose all powers and will stop receiving a salary once the Senate approves article 155 which imposes direct central government rule on the region, the Deputy Prime Minister said on Monday. A single representative may be temporarily instated by Madrid to govern the region after the Senate approves direct rule, Soraya Saenz de Santamaria said in a radio interview. The Senate is expected to approve the measures on Friday. 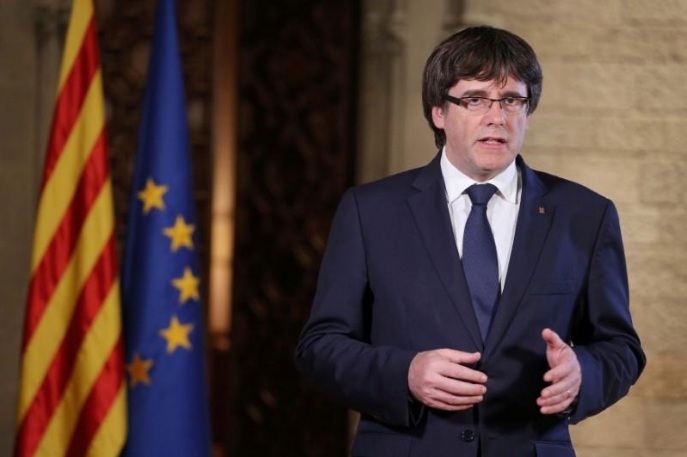 Regional leader of Catalonia Carles Puigdemont will lose all powers and will stop receiving a salary once the Senate approves article 155 which imposes direct central government rule on the region, the Deputy Prime Minister said on Monday.